QUESTION: "In the Lord's prayer, the plea 'lead us not into temptation' must surely be a mistranslation. James 1:13 says: '... For God cannot be tempted with evil, neither tempteth he any man.'" ANSWER: You are right. In these verses, the word "temptation" comes from the Greek word peirasmos, which means a "test" or a "trial" (Arndt-Gingrich lexicon). The Good News for Modern Man translates Matthew 6:13: "Do not bring us to hard testing, but keep us safe from the Evil One." Of course, God does allow our faith to be tested (see Gen. 22 and Job 1, 2). Q: "I would like to know how to become a co-worker." A: God has always had disciples, helpers and "co-workers" to aid His leading ministers in carrying out their commission of preaching and publishing the gospel. God's Work today is growing in power and effectiveness. How? It has been made possible only through the combined efforts of thousands of co-workers whom God has called to help financially support this great Work. 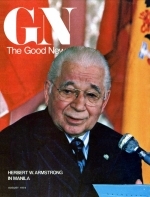 In the earlier days, our editor in chief, Herbert W. Armstrong, was able by himself to reach only a handful of people. But as the number of dedicated co-workers who voluntarily gave their contributions and tithes and offerings increased, so did the scope and power of God's Work. Now, just what is a co-worker? To find the answer, notice some New Testament scriptures, beginning with II Corinthians 6:1: "We then, as workers together with him, beseech you also that ye receive not the grace of God in vain." In context this scripture clearly shows that all true Christians should be workers together with Christ in reaching the unconverted world with His message. Whether in helping, housing, or feeding a true minister of God, or sending him on his way with food and money (this type of help was especially needed in the time of the first-century Church), God has always given many others the privilege and opportunity of being direct helpers in carrying out His Work. The Apostle John encouraged those called in his time to receive and support the true servants of God: "... That we might be fellow-helpers to the truth " (III John 8). Again, Paul beseeches: "And I in treat thee also, true yokefellow, help those women which laboured with me in the gospel, with Clement also, and with other my fellow-labourers [co-workers], whose names are in the book of life" (Phil. 4:3). So, as in apostolic times, God has today raised up a growing family of co-workers — laborers together with Christ — who are helping out financially and with their moral support, and in their faithful, fervent prayers for this Work of God. These co-workers, who give their lives (Rom. 12:1) here and now as living sacrifices in carrying out God's Work, are certainly laying up treasure in heaven! Jesus said: " For where your treasure is, there will your heart be also" (Matt. 6:21). After a person has voluntarily of his own free will expressed a desire to help financially with this great Work — or voluntarily begun to contribute donations — he or she, in effect, automatically becomes a co-worker.